The Banter Bulldogge was developed by Todd Tripp in Ohio in the 1990's. The Banter Bulldogge was created in an effort to recreate the Brabanter Bullenbeisser, a now extinct Belgian breed from the 1700's. Mr. Tripp utilized selective breeding of various bully working breeds as well as the Boxer breed, when creating his foundation stock. The most important, being that a percentage of Boxer was present in each of the foundation stock for the Banter Bulldogge. In fact, it was the Banter Bulldogge's ancestor, the Brabanter Bullenbeisser that can be directly related to the modern day Boxer as well as other mastiff breeds and the Olde English Bulldogge. The Banter Bulldogge is often utilized for hunting, working, guarding, weight pulling as well as excellent companion dogs. The male Banter Bulldogge will typically reach heights of 21-24 inches and an average weight of 50-85 pounds. The female Banter Bulldogge will typically reach heights of 20-23 inches and an average wieght of 50-75 pounds. The coat of the Banter Bulldogge will be short and smooth to the touch. Various coat colors are acceptable for the Banter Bulldogge, including black, red, fawn, any brindle and may or may not include a black mask. Instances of white within the coat up to 30% is acceptable. The Banter Bulldogge is a fun-loving and loyal breed that makes an excellent family companion. The Banter Bulldogge loves to play and will be happy to spend their days goofing off with their human family as well as other canine friends. The Banter Bulldogge, as long as it is properly socialized, is known to be excellent with other dogs as well as other family pets. The Banter Bulldogge is also a very intelligent breed. They are known to be very trainable dogs and recognize when play time is over. The Banter Bulldogge is a fun-loving and loyal breed that makes an excellent family companion. The Banter Bulldogge loves to play and will be happy to spend their days goofing off with their human family as well as other canine friends. The Banter Bulldogge, as long as it is properly socialized, is known to be excellent with other dogs as well as other family pets. The Banter Bulldogge is also a very intelligent breed. They are known to be very trainable dogs and recognize when play time is over. The Banter Bulldogge is a cheerful, but protective breed. While this dog may be happy-go-lucky with the family, they take no chances with strangers. The Banter Bulldogge is mildly suspicious but will bark whenever an intruder is noticed or danger is sensed. It is this instinct that makes the Banter Bulldogge an excellent watchdog. Be sure to socialize your Banter Bulldogge around not just animals, but other people as well. The more frequently your Banter Bulldogge is introduced to strange people in strange situations, the more likely it is that he will react well to it. You can find Banter Bulldogge puppies priced from $0 USD to $0 USD with one of our credible breeders. Browse through our breeder's listings and find your perfect puppy at the perfect price. The Banter Bulldogge is a cheerful, but protective breed. While this dog may be happy-go-lucky with the family, they take no chances with strangers. The Banter Bulldogge is mildly suspicious but will bark whenever an intruder is noticed or danger is sensed. It is this instinct that makes the Banter Bulldogge an excellent watchdog. Be sure to socialize your Banter Bulldogge around not just animals, but other people as well. The more frequently your Banter Bulldogge is introduced to strange people in strange situations, the more likely it is that he will react well to it. The Banter Bulldogge is a relatively healthy breed with no known genetic deficiencies. The Banter Bulldogge requires very little attention regarding grooming and is considered an average shedder. The short coat will require only the occasional brushing to remove the excess dead hair. Be sure to regularly check and clean the Banter Bulldogge's ears to prevent health issues such as infection. Bathing should only be done when necessary, as this will remove the natural oils from the skin of the Banter Bulldogge. As mentioned previously, the Banter Bulldogge is an intelligent breed that should be relatively easy to train. The Banter Bulldogge's eagerness to please will always benefit the leader of the pack. However, it is still necessary to maintain an air of authority when dealing with your Banter Bulldogge. Any dog that senses weakness in their pack leader will likely attempt to claim the role for themselves. The Banter Bulldogge can do well living in an apartment, however, they must receive regular daily exercise. The Banter Bulldogge is relatively inactive when indoors, and so must be taken on walks or to a safe, fenced area to play in order to exert their excess energy. Failure to do so may result in pent up energy that can turn to destructive behavior. Banter Bulldogge Puppies for Sale - Shipped Worldwide! Finding the right Banter Bulldogge puppy can be dog gone hard work. PuppyFind® provides a convenient and efficient means of selecting and purchasing the perfect Banter Bulldogge puppy (or Banter Bulldogge puppies) from the comfort of your home, 24 hours a day, 7 days a week. 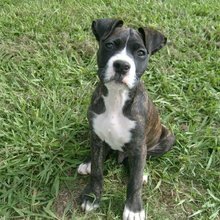 Take advantage of our PuppySearch or leisurely browse our directory of hundreds of dog breeds, Banter Bulldogge dog breeders, Banter Bulldogge dogs for adoption, and Banter Bulldogge puppy for sale listings with photos and detailed descriptions. Some Banter Bulldogge puppies for sale may be shipped Worldwide and include crate and veterinarian checkup. Many Banter Bulldogge dog breeders with puppies for sale also offer a health guarantee. With thousands of Banter Bulldogge puppies for sale and hundreds of Banter Bulldogge dog breeders, you're sure to find the perfect Banter Bulldogge puppy.